Home » What U Got On? Category Archives: What U Got On? 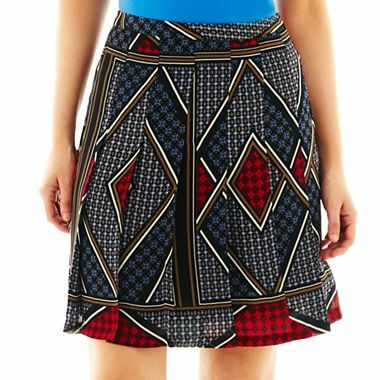 If you owned this skirt, what would you wear with it? The background color is a deep, deep blue, not black. Posted in What U Got On? This lady’s blog? Love! Stumbled across it on Pinterest and it is my new go-to for packing. I am not about that paying luggage fees life! I so plan on doing this for our trip this summer and henceforth now and forever more. Her outfit pics are also quite helpful – I am bad about wearing the same clothes the same way all the time. Hopefully this will kick my remixing skills up a notch or three! Posted in Blogroll, Raves, What U Got On? This morning on the Twitter I mentioned that I was wearing an argyle sweater, a striped shirt and polka dot socks in an attempt to pattern-mix like all the fashion bloggers are doing nowadays. And that I felt foolish. After posting a few pics, Twitterland assured me I looked fine – but that the socks may have been overkill. Fair enough. I pretty much wear the same thing every day. A pair of pants, a tank top, and a cardigan. Lighter fabrics when it’s warm, heavier when it’s cold. But pretty much the same thing. This week I’ve broken out of my rut – a little. Tuesday I wore this dress (in green) with brown tights and boots. I think it’s too short to wear to work again but guess I’ll wear it on the weekends. Today I went “wild” and mixed patterns. That’s all I’ve got to give. I need to shop my closet, come up with some new combos, and expand my style just a wee bit. Any tips, hints, suggestions? How do you shake up your wardrobe when you’re bored with the contents of your closet – buy something new or work with what you’ve got? Why does my hand look so freakishly large?!? Never mind. 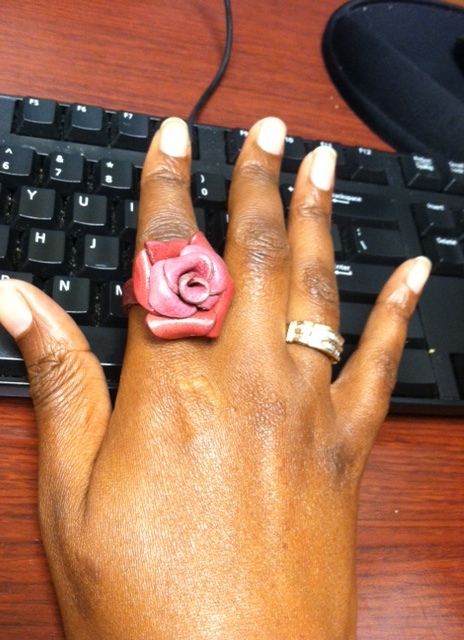 Just check out my leather ring bling! 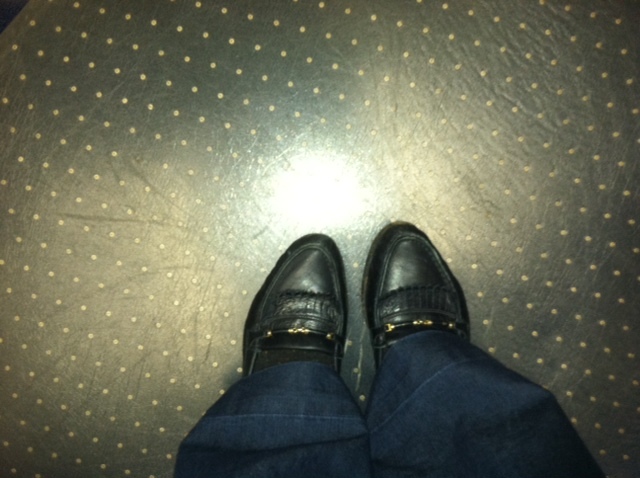 Do you match your socks to your shoes, your shirt, your pants? 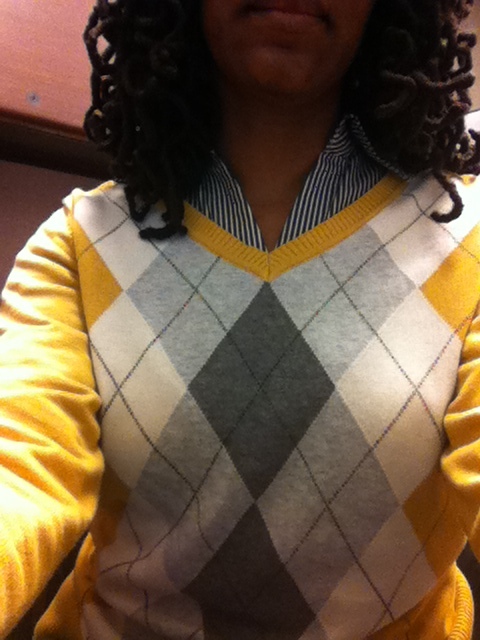 I had on a blue, yellow, white and fuchsia striped cardigan, a white tank, blue jeans and fuchsia loafers. What color socks “should” I have worn?? I do not care for red velvet cake. I don’t understand the hype. This weekend we celebrated my birthday since Smoochy wasn’t home on Tuesday. He brought me a cheesecake and his feelings were so hurt when I told him I don’t like cheesecake. Yes, I bake them – because other people like them, not for my own personal consumption. Yet another dessert over which I do not understand the hype. Team pound cake! Smoochy told LG about this trip to Spain we are trying to make happen. Why, why, why??? Sir, you are not new to this parenting game – I don’t tell LG anything about going anywhere until the night before. At the earliest! While I appreciate all of her questions and concerns? I really was not trying to deal with this for the next 8 or 9 months. Grrrrrrr! In 79 days? I will be free to buy nail polish once again. Bwahahahahaha! I.Cant.Wait. Running makes me hungry and sleepy. Guess what I was before I started running? Hungry and sleepy. Why am I doing this again?!? Did I tell y’all that last Sunday when we were driving back from Arkansas my child said “Daddy, when we get to Louisiana will you pull over so I can get a scratch-off ticket?” Hold up. What in the world does this kid know about a scratch-off ticket and gambling? Maybe she is sneaking out of the house once I fall asleep at 9 8 every night. Tarjhay has sweaters for $15 this week. Have I mentioned how much I enjoy their cardigans? Well, I do. And I’m surely going to purchase one – and only one – after work today. Now, if we could get some consistently cool weather, it’ll be all to the good. Posted in Life In General, Lovegirl, Mi Familia Loca, What U Got On? Cast Your Vote – No ID Needed! "Yo Doug with your Ballys on" Yeah, I've owned these flats since half past forever. They are some of the most comfortable shoes I've ever owned and I faithfully pull them out on casual Fridays, rock them with pride, and rap at least one bar of "The Show." Posted in Photos, What U Got On? New book club discussion date: Monday, October 17. Thanks much to Simply B for requesting an extension…I surely need it! We’re reading “A Life of Reinvention: Malcolm X” if anyone wants to do some quick reading over the next two weeks. Our pastor is teaching us how to study the Bible. Really great series. Very common sense, but nothing I’d ever considered before. I’ve read the Bible, but never studied it. We’ve started with the book of Ephesians, and though I’ve read it on several occasions, I’m reading studying from a new perspective and really enjoying it. JSU’s homecoming is this week. And they’re playing my undergrad alma mater UAPB! I cannot wait for Saturday’s game! We’ve bought a tailgating lot, I’ve pulled together my black and gold accessories, I think a few friends are coming down, and I’m ready to talk ish! Let the games begin! Drake has got to be the worst “rapper” ever. Yep, ever. I’d rather listen to…hell, anybody else. It’s breast cancer awareness month. If you’re not up on your self-exams, annual checkups, or your No Thank You Ma’amogram (KRock – August 2011) do what you need to do and get down on it! You know what’s better than new underwear? Nothing! Okay, there are better things. But new unmentionables rank pretty high on my list. Anybody got any recommendations for a new vacuum? Don’t bother mentioning a Dyson, Miele, or Oreck…that’s not happening. This lady at work wears too much perfume. And I don’t like the scent. Smells like the stuff the groomers used to spray on my dog. Until I told them to stop ’cause it stank. In case my Mama’s reading – happy birthday sweets! I love you much! That’s it for now. Hope everyone has a marvelous day! Posted in Book Club, Books, Life In General, Mi Familia Loca, What U Got On?